HP-C18 uses full coverage bonded silica packing, which provides high stability. Compatible with 100% aqueous mobile phase and suitable for separations of acidic, neutral and basic organic compounds, as well as pharmaceuticals and peptides. ODS monolayer formed by special bonding chemistry does not collapse in pure aqueous solution. Sepax HP-C18 uses full coverage bonded silica packing, which provides the exceptionally high stability. 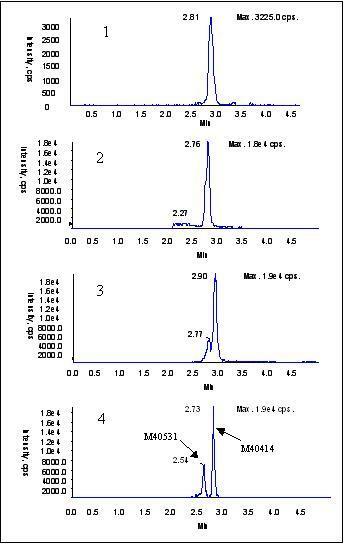 Figure 1 shows the highly reproducible retention time for three standard compounds: aniline, anisole and toluene after 13,000 column volume runs in a mobile phase of 85% methanol and 15% water. 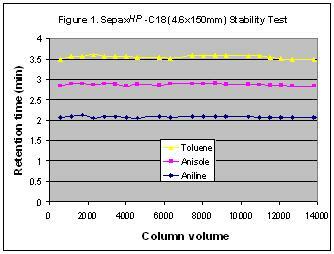 Such high stability allows Sepax HP-C18 extremely suitable for validation of various analytes. 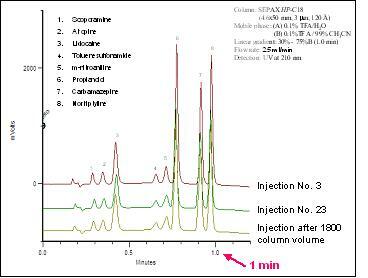 Figure shown below is a real application of Sepax HP-C18, showing fast separation of 8 pharmaceutical molecules by a 3 µm, 4.6×50mm short column. After 1800 column volume of "0.1% TFA and CH3CN mobile phase" was pumped, the column still shows almost identical performance! Sepax HP-C18 has better selectivity and resolution for organometallic complex isomers compared to other competitors' C18 phases.